Maisy finds a new world to conquer. Watching the setting sun give way to the moon and stars (with the help of an arced slider) and wondering what it’s like up there, Maisy blasts off for a three-day trip through space. Feeling “light and floaty” after landing on the lunar surface, she plants a flag (a red-and-blue mouse on a field of yellow), admires the distant Earth, rides her moon buggy over bumps, and then returns to her home planet with a triumphant splashdown. 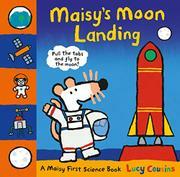 Elementally simple as the narrative and the cartoon illustrations are, they nevertheless convey both specialized vocabulary such as “satellite” and “landing module” and technical information—one pop-up, for instance, shows the stages of Maisy’s rocket separating, and elsewhere, a distance gauge on her control panel reads “225,622 miles,” which is the moon’s distance at perigee.